Have you ever looked closely at a dollar bill? There are many parts to this currency that keep illegal counterfeiters from reproducing the bills. The higher the dollar amount of the bill, the more complex it gets. For this particular science project you will want to gather several different bills: $1, $5, $10, $20, along with a stereo (dissecting) microscope. One of the ways that counterfeit bills are discovered is by the type of paper that is used. Take one of your bills and notice the texture. Have you ever seen a wet dollar bill? It does not fall apart like standard paper does. 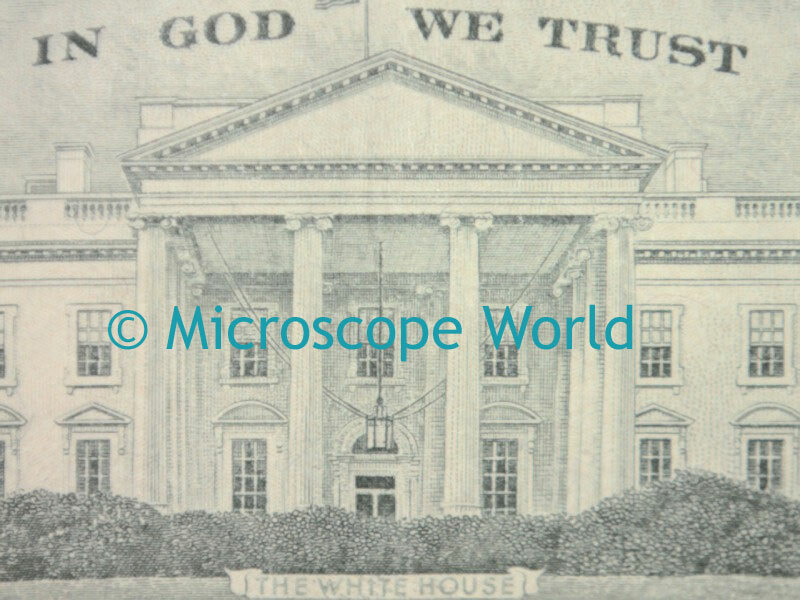 Try to find a bill with a small tear in it and place it under the microscope. What do the paper fibers look like at higher magnifications? Do you notice any red or blue fiber threads in the dollar bill? These are used to prevent counterfeiting. Next, start with a single $1 bill. How many number and letter combinations do you see on this bill? Now put this bill under the microscope and notice the ink in the printing of the bill. Can you see any other small details that might not have been noticeable without the microscope? 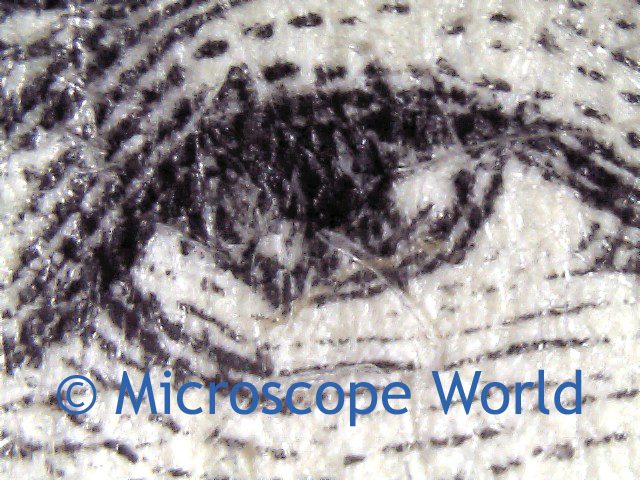 $1 captured at 40x magnification with the MW1-LD1 digital kids microscope. Next, let's move on to the $20. Hold the bill up to the light. Do you notice any watermarks (lightly colored images) that were not visible without light shining through the bill? On the face side of the bill, look at the number in the bottom right hand corner. If you tilt the bill or shine a light on it, notice that the colors change! $20 captured at 5x magnification. 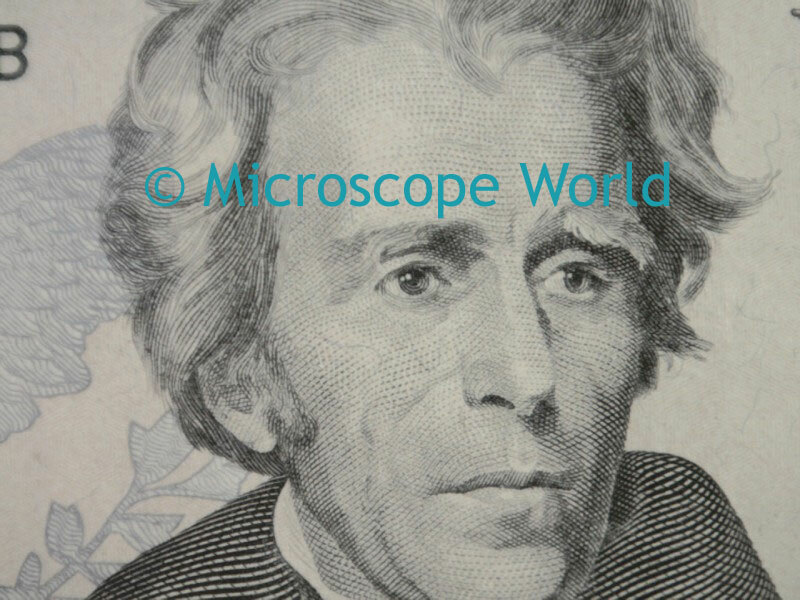 Place the $20 under your stereo microscope and look closer at the edges of the pictures on the face side of the bill. Do you see any hidden words or phrases? What details do you notice in the White House? Make a list of some of the details you discover under the microscope. Then have other family members or classmates look at the dollar bills and see if they can discover all the same details!